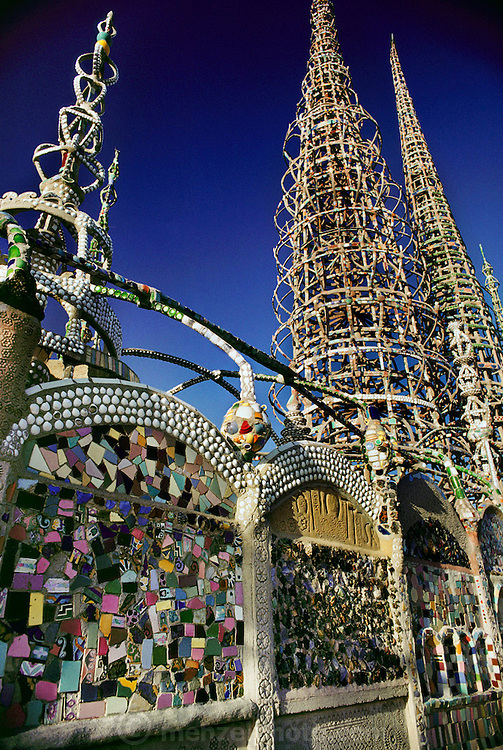 Watts Towers, Los Angeles, California. Designed by Simon Rodia 1921-1955. Untrained as an architect, engineer, or builder, Simon Rodia created a complex of towers that rose over one hundred feet tall. Composed of structural steel rods and circular hoops connected by spokes, the towers incorporate a sparkling mosaic of found materials including pottery, seashells, and glass. Rodia's house, destroyed by fire in 1957, resided within the complex..Declared hazardous by the city of Los Angeles, the towers were threatened with demolition until an engineer's stress test proved them structurally sound. They have since been designated a cultural monument. USA.